Do you like Kpop chart show? I think many of you may watch Kpop stars' performances through various Kpop chart shows such as 'Show! Music core', 'M Countdown', 'Music bank', 'Inkigayo' and 'Show! Champion'. Did you ever wonder what happens at the broadcasting site of Kpop chart shows? 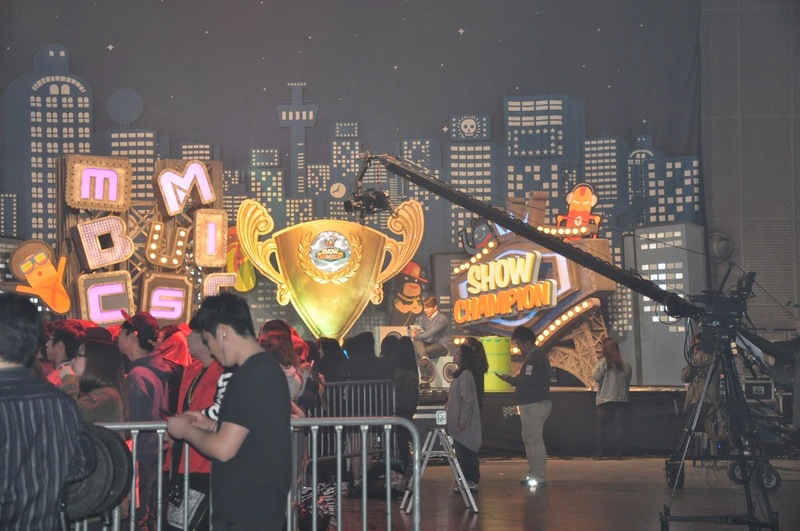 Let's talk about a behind-the-scenes glimpse of Kpop chart show through the case of 'Show! Champion'. I've recently been to the show's live broadcasting site located at the Nuritkum Square in Sangamdong, Seoul. Before coming on the stage, idol stars spend time in a number of different ways. Some of them(especially female idols) fix makeup and check their costumes. Yeah, they make a lot of effort to look good on TV. Other idols pass time gossiping, which helps them relieve tension before performing on stage. They laugh and chat, but once they hit the stage, they change facial expression and show charismatic performance. Imitating other singers' dance moves is idol star's another way of spending time. Watching other singers' performance, the idols dance playfully, while this helps them draw up their own stages. Idols always greet everyone first because they have received educations since their trainee period to do so. They usually greet with a deep bow. Between the performances, if idols run into one another, they are busy bowing to each other. Especially, juniors try to behave well in front of seniors. The most impressive idol of the day was 5-member boy group A-Prince. After the broadcast was ended, at an exit, the members said "Thank you for your effort" to each and every person who participated in the broadcast. 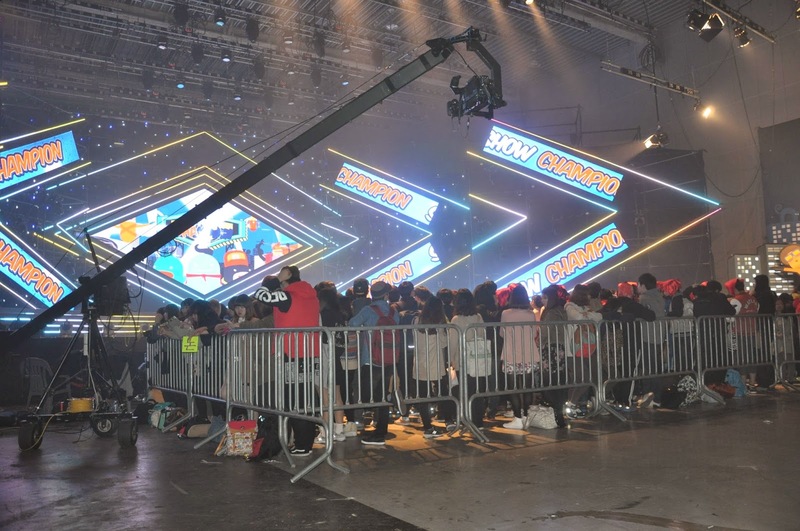 The fans who visited the broadcasting site to see their favorite Kpop idols cheered enthusiastically for the idols. Among boy groups, Super Junior-M received the loudest cheer even though they didn't appear there because they pre-recorded their performance before the live broadcast. Watching the recorded video on a big screen, the fans cheered for Super Junior-M.
Crayon Pop was the girl group who received the loudest cheer. Unlike Super Junior-M who received loud cheer from female fans, Crayon Pop was popular with male fans, while NS Yoon-G caught eyes of male fans by showing off her glamorous figure. Super Junior's Kangin is currently playing the MC to the show. As a veteran idol who debuted in 2005, he brightened up the mood of the broadcasting site. Here's the conversation content between Kangin and APink at the rehearsal of the show. The content is a little different from actual broadcasting. Kangin: I've heard that the APink members couldn't experience first kiss yet. APink's Jung Eunji: Who said so? Well, I don't think so, haha. Kangin: I'm sorry. Lee Teuk told me so. Instead, please blow a kiss to the viewers. It should be a deep kiss. Here's the conversation content of actual broadcasting. Jung Eunji: Well, I'm not the one because there was a kissing scene in my drama. Kangin: Oh, then please blow a kiss to the viewers. At the broadcast, APink took over the first place with its latest song 'Mr. Chu'. After winning the prize, the members looked as if they’d never even expected to receive the award. Leader Park Chorong said "I'd like to thank you all for this wonderful award. I'm so grateful to our agency's staff members and fans. The APink members suffered many hardships. I love you," while Kim Namjoo stated, "Thank you, fans. I love you. And I want to say thank you to my parents." Especially, member Son Na Eun was moved to tears, and other members tried to soothe her. Even after the broadcast was ended, the members didn't leave the stage for awhile and extended their thanks to the fans, saying "Thank you. I owe it all to you."